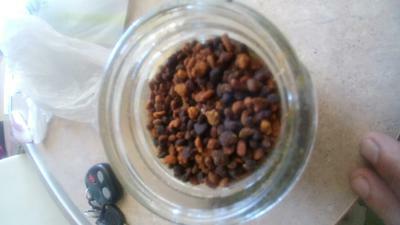 I am a truck driver and I stopped at a fruit place and I got some Bee pollen in a little jar. I did keep it in a cabinet but I ended up forgetting about it and it's been about 6 - 8 months and the pollen in the little jar has turned a dark brown color. When I opened it there was little spider web like substance around the top. Can I still consume it? I would not recommend that you consume this bee pollen.